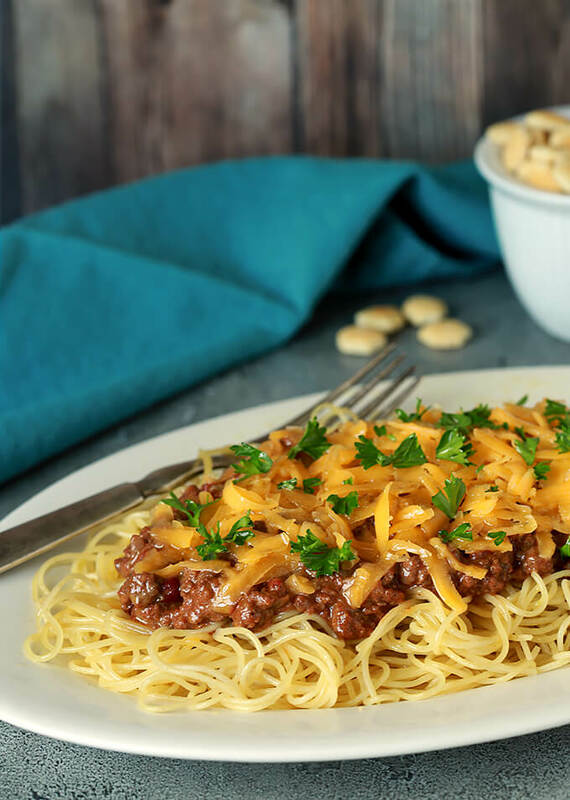 Cincinnati Chili is a unique and delicious version of chili heavily influenced with Greek spices and topped with cheese in the version we love the best. I’m originally from St. Louis but when my then husband and I had only been married a couple of years he was offered a great job in North Carolina and off we went on a grand adventure. Our only child was a dog named Heather and the notion of moving to the South was different and exciting for both of us with such strong Midwestern roots. We bought our first home in NC and both of our children were born there so it was with a heavy heart that 10 years later I agreed to move again to Denver, Colorado. The climate was hard to adjust to…not just the dry air but a bareness that seemed the polar opposite of North Carolina where we had lived on an acre lot in a neighborhood which was basically cut out of a forest of trees. Our new home in a suburb of Denver was at most 1/5 of an acre with no grass and no trees and they would not be planted for months after our move in late fall. More than grass and trees though I missed some of the best friends I had ever had and dealing with the exhaustion of adjusting to living at high altitude I was ready to bolt and run back to North Carolina in a heartbeat! Luckily our neighborhood was filled with a lot of transplants and I soon started to meet a lot of other moms in the neighborhood; mostly through my kids and my volunteering at their school. I quickly became fast friends with Elaine and our daughters, both named Emily, also became best of buds. Elaine and her family were from Cincinnati, Ohio and though we shared Midwestern roots, we also were able to share with each other some food traditions unique to our own area. I introduced her to Gooey Butter Cake and she shared Cincinnati Chili with me. 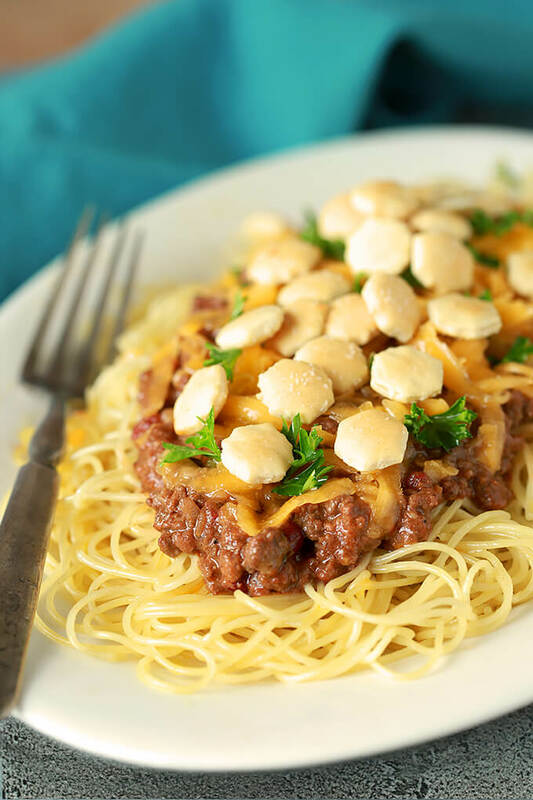 The recipe Elaine had was a recreation of the dish from the iconic home of Cincinnati Chili, Skyline Chili. 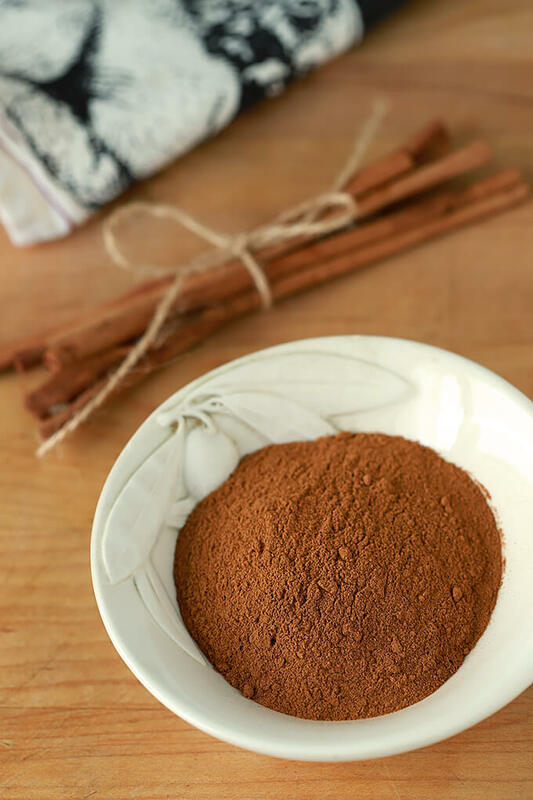 The original owner’s Greek roots can clearly be seen in the unique blend of spices including cinnamon, cloves and cocoa. That’s right! Other secrets to this recipe include the initial braise of the meat in water, the long slow cooking and the overnight refrigeration, which allows all the flavors to meld (and sure makes it easy to remove any excess fat). I’m not sure I would have ever made this chili on my own based on that ingredient list. Cinnamon? Cloves? Really? 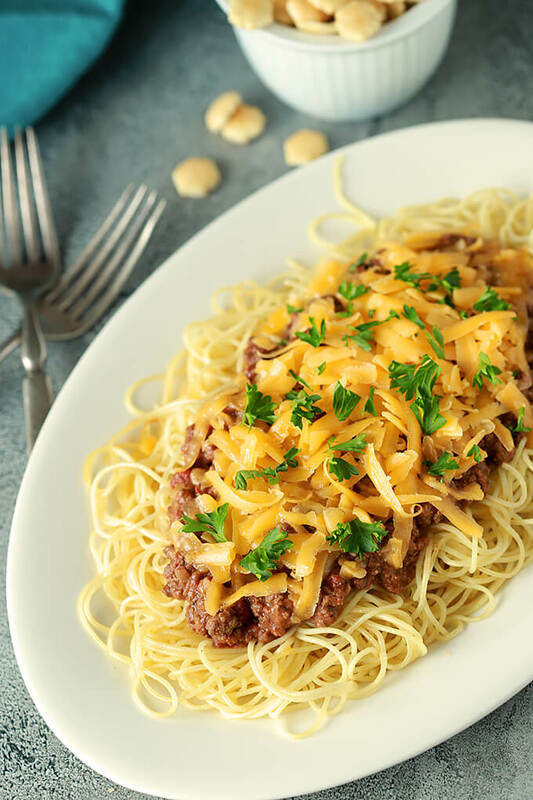 But my taste buds were introduced before I saw those ingredients, the spaghetti and cheddar cheese were irresistible and I’m glad Elaine shared this food tradition from her hometown because it’s been a favorite ever since. No, you will not confuse it with a cinnamon roll, I promise. All of the flavors combined make for a unique spicy taste that is almost difficult to describe but tastes absolutely delicious. 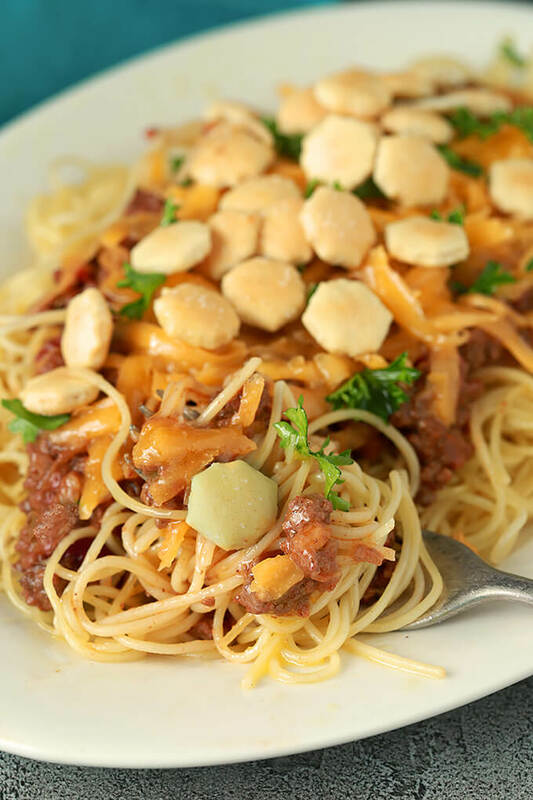 Skyline serves their chili different ways depending on how you like it topped but we’ve always been a fan of Three-Way…served over spaghetti with shredded cheese. And always with oyster crackers; sure it’s pasta and crackers but it’s a great crunch so it’s allowed! I think next time I’ll go with onions too; I love raw onion and now that my youngest is no longer living here I have to remind myself sometimes I can do what I want! If you have the time, I’m going to suggest that you shred your own cheese for this dish. Yes, it’s a bit of a pain, although I’ll be honest, the box grater was great for photos but without that need? 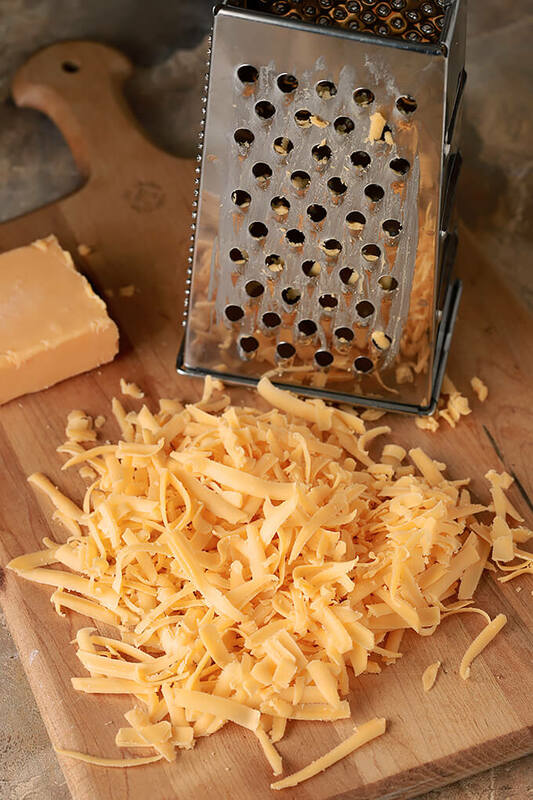 A block of cheese can be zapped in seconds using one of the graters that come with a food processor. Storebought cheese has an additive called cellulose added to shredded cheese that keeps it from sticking together. Cellulose is made from wood pulp. I try to avoid wood pulp in my food; that is all! That’s my one perfect bite; pasta, chili, cheese and oyster cracker. Parsley not required…I just like the touch of color if I have it in the fridge. I’m going to have another dish of it tonight and think fondly of Elaine and Emily…they long ago moved back to Cincinnati and sadly we lost touch but I will always have such fond memories…including this one that I can recreate! A little more heat but still not on fire; one of our favorites. My daughter won a Chili Competition at work so of course I needed to have this on my blog! Filled with beef and bacon and with a great smoky flavor. Add water and beef to a large skillet or pot. Bring to a simmer while stirring until the ground beef is in very small pieces. Simmer for 30 minutes. Add the rest of the ingredients and simmer on low, uncovered, for 3 hours. Add water as needed if the chili becomes too thick. 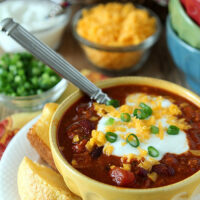 Refrigerate the chili overnight; remove the layer of fat from the top before reheating and serving. Put spaghetti on serving plate, top with chili and then generously top chili with shredded cheese. I really like how you started with family history and then moved on to the part where you explain about the recipe. Good read. Five-way for me, please. I’m been lucky enough to have this at the source — the downtown Skyline in Cincinnati. Good stuff. 🙂 You did a terrific job with it — thanks. WHERE CAN I BUY CINCINNATI CHILE GROCERY STORES NORTH CAROLINA? Hope that helps…or you know, make the recipe above; it’s really not hard! Not as good as homemade. So I have a very picky bf who hates onions! If I don’t add them in there, will this completely change the chili? This is my first time trying it. Thanks! haha! hmmm maybe i’ll just pretend that they’re something else or not mention that they’re in there! We have it so you can too it with onion, but it’s never in the recipe! I grew up in Cincinnati and have eaten Skyline Chili my whole life. Well, I’ve been eating at the restaurant my whole life. As for the chili, I would only eat the noodles with cheese or hotdogs with cheese until my tastes developed as I got older. I few things about Skyline; The cheese is important (people order it by itself and eat it out of the bowl) it’s very thin, long, and stringy and unlike cheese you will find anywhere else. Also, three four and five ways are eaten cut into bites with a fork not wrapped around the fork like regular spaghetti. Meals of Skyline begin with oyster crackers dotted with hot sauce and end with peppermint patties. And finally, chili spagett (as my grandmother calls it) and coneys are perfect after a night out drinking with friends. Enjoy your chili everyone! It’s funny cause I really thought about the cheese Jane and decided to just put my own spin on it because there was no way I could recreate what they do! I did not know about the Peppermint Patties because I’ve never actually been there but I happen to have a box in the pantry and will remember that next time…thanks. I’m from the Chicagoland area, but my mom is from Cincy and a majority of my family still lives there. Cincinnati chili is something I grew up with and is one of those things you either love or you don’t. I love. I remember the first time my husband (boyfriend at the time) had it. I was hoping he loved it too, and luckily he did — coulda been a deal breaker otherwise! Thanks for posting. I have a special spot in my heart reserved for Skyline. You are so right…but I think it is definitely something you have to at least try. Sounding different has stopped a few folks…ah, their loss right? I’ve long ago lost touch with Elaine but I never make this that I don’t think of that time and our little girls. Food really is more than just food. What a sweet post. I just saw an episode of Diners, Drive-Ins and Dives that showed Cincinnati chili and have really wanted to try it ever since. So glad that I now have a recipe. Thanks! Thank you Karen and so good to see you again today. Aren’t we lucky to have such a great group? I just love our get togethers, failed cake and all. By the way, I did it again and got another sink hole. Don’t you just love baking at altitude? I can almost smell this chili through the computer screen!!! The photo is gorgeous by the way – I love all that cheese!!! I ‘ve made Cincinnati chili before but it was different and I think this recipe sounds much better. With 38 (yep 38!!!) La Crosse games coming up, my slow cooker is going to be getting lots of use so this recipe will be perfect!!!! Would be perfect…and in my book…if serving for a game type thing for kids? I just might mix it with macaroni and make it even easier. Chili Mac & Cheese? We were recently invited to a Cincinnatti chili party! It was delicious! Glad to have this recipe to refer to – it’s a great party food. I realize most people can figure this out but there are, in fact, people that might really “add all the rest of the ingredients” in step 2 including the pasta, cheese and crackers Shouldn’t it be “add rest of ingredients through Worcestershire sauce”? You might be right…thanks for pointing that out! I’ve separated out the last items it gets served with from the rest of the ingredients, that should do it. That looks really good, and I will say that the chili pasta thing is one I do not really get. That said, I want to dive right in and eat. Yum!! You could always order #1; just the chili but I must say that this particular dish would seem naked without it to me! Clearly a sign. Do it! Must be something in the air – I’ve been in the same nostalgia mode, too. 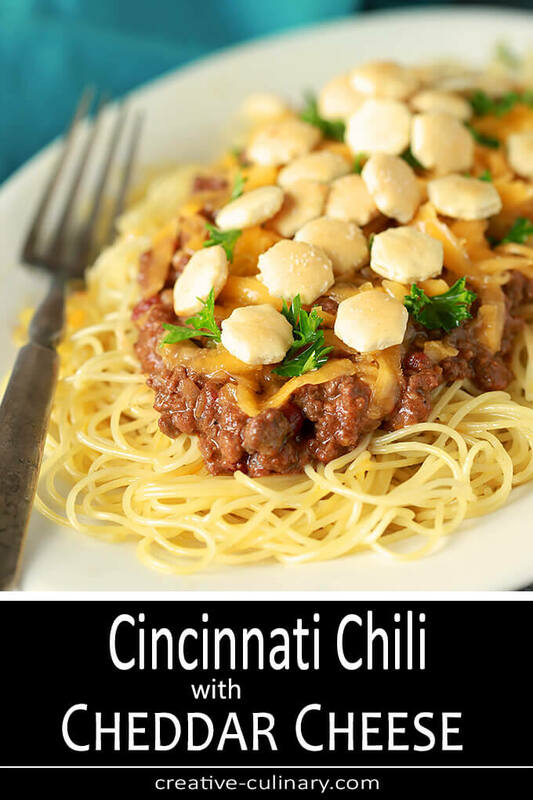 I wasn’t quite sure what distinguished Cincinnati chili from other beloved regional versions, but I love the unusual blend of spices – sounds tasty, esp. with spaghetti and cheese! I’m familiar with this dish as Greeks do on occasion add cinnamon into the meat sauce. Great pics, delicious meal! Thanks Peter…was actually wondering when I made this if my Greek blogger friend would concur. Whew! What an interesting combination of spices! 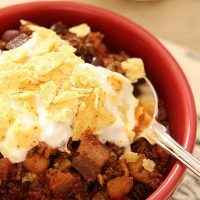 I love trying different chili recipes so, yes, of course, I will be trying this one! I love that law and of course, will do exactly as you say. Now I want a hot dog with chili.